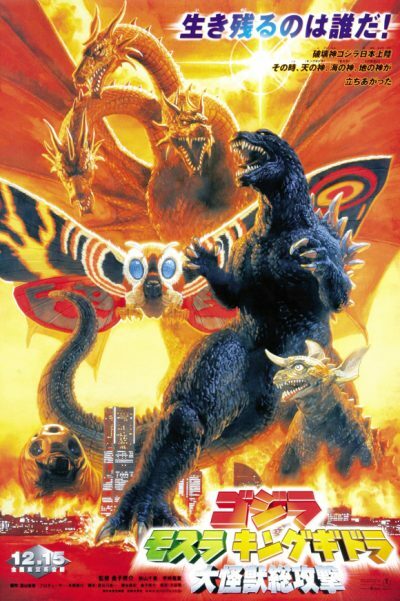 Even though this was released the year after Godzilla vs. Megaguirus, it feels as much of a reboot as a sequel. While it acknowledges Godzilla’s existence, according to the film, he has not been seen in almost 50 years. Apparently, the twenty-odd movies in between, were all the products of a fevered imagination. The plot is relatively basic, even by the standards of kaiju movies. Godzilla returns from his ocean slumber and begins wreaking havoc. 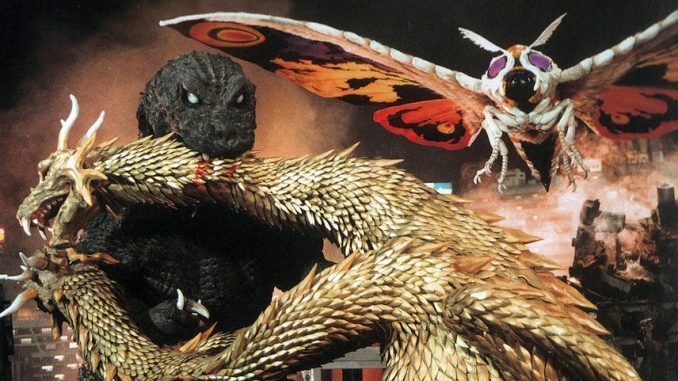 The trio of “guardian monsters” – Mothra, Ghidorah and Sir Not-Important-Enough-to-Make-the-Title, Baragon battle to defend Japan from his assaults. There are a number of human beings running around as well. They can, as usual, be ignored. For this is all about the monsters, though if we learn one truth here, it’s that not all monsters are created equal. There’s very definitely a pecking order here. Baragon is not just deemed unworthy of a spot in the title (though they could find room for a colon and four entirely superfluous words). If I can sprinkle in a few pro wrestling terms, he’s the nameless jobber already in the ring, a curtain-jerker sent out first for a squash match at the hands of the top heel. These metaphors is entirely appropriate, for their battle is overseen by a TV helicopter, whose crew provide a breathless running commentary on events. At least, they do, until Baragon attempts a high-risk maneuver, which Godzilla reverses, flinging poor Baragon into the helicopter, and ending this particular PPV. Possibly the weirdest thing here is the motivation behind Godzilla’s resurrection. At first, I wondered if something had been lost in the English dub, because it appeared that he was resurrected by the souls of the people killed by the Japanese in World War II. Surely some mistake? I was so uncertain about this, I cross-checked it with Wikipedia, and yep: these tortured souls “wish to destroy Japan as punishment for people’s attempts to forget Japanese wartime atrocities.” Okay… I’m sure that made sense at the time. I must award this a bonus point for its sly kick at the much-derided Hollywood Godzilla, made in 1998: “Monsters resembling Godzilla have been seen in the United States… The Americans said it was Godzilla, but all the Japanese scientists denied it.” But once Mothra has merged into Ghidorah, the film loses its heart [hohoho, that’s a little in-joke which will only make sense in the final shot here], and is content merely to go down the well-trodden (or perhaps, well-flattened) path we’ve seen before. Certainly not terrible, but not with much to separate it from any of the others, and certainly falls short of its delightfully over-enthusiastic title.